Features: Body cast bronze, throw high plus plating. Salt spray test high standard nozzle, adjustable gear spray hand. Installation instructions: The newly renovated user removes some sediment and other debris before installing the drain. About the size: This product is manual measurement, because everyone's measurement methods and measurement tools, a little error is normal, the size of the error will not have any impact on product quality. This is a large-scale plating shower shower set, copper casting, hand-held shower switch, durable, can not afford to paint, the use of safety. It uses a thicker mounting base, stable installation, bending, anti-aging, easy to use. The main body made of high quality copper ingots, corrosion resistance, thermal conductivity, good antibacterial effect. 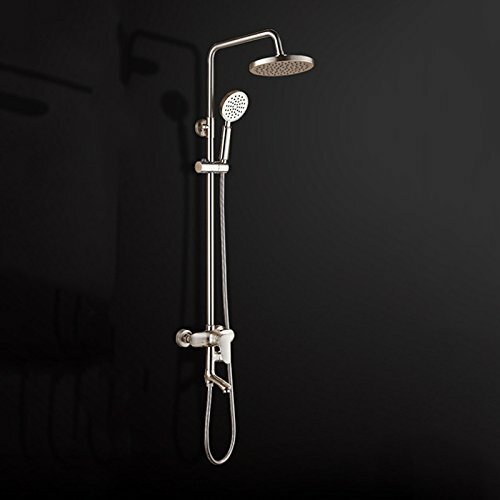 It uses environmentally friendly lead-free, shower rod can be turned up and down, pressurized nozzle, adjustable bracket 90 °. It uses a safe and reliable two-file regulation separation, fine copper casting, plating plus electroplating. If you have any questions about this product by Boyang, contact us by completing and submitting the form below. If you are looking for a specif part number, please include it with your message.